I have been on a bit of a nursery decor kick lately. A few days ago I posted this floral watercolor wreath art print along with these matching printable baby announcements. Today I have this glitter paper DIY baby mobile! Living in the Pacific Northwest means lots and lots (and even more) rain. This, combined with my two Scandinavian team members, we know what it’s like to feel like you are living under a rain cloud! 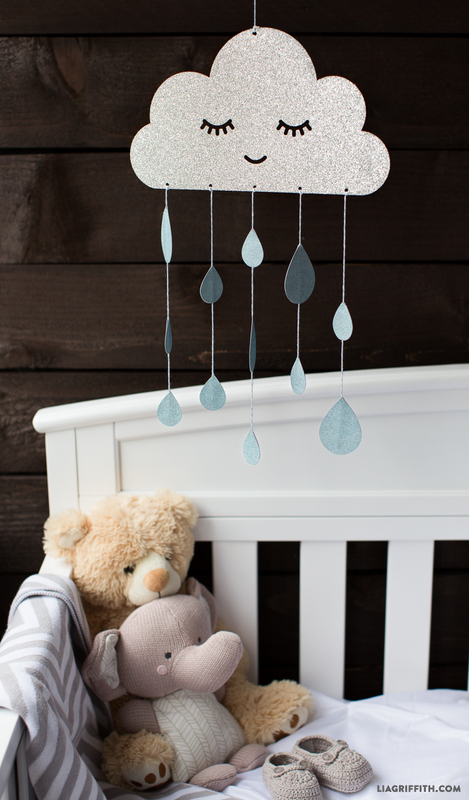 So of course we were inspired to make this adorable DIY baby mobile. We have included a PDF version for those who are hand-cutting and an SVG template for everyone with a cutting machine. 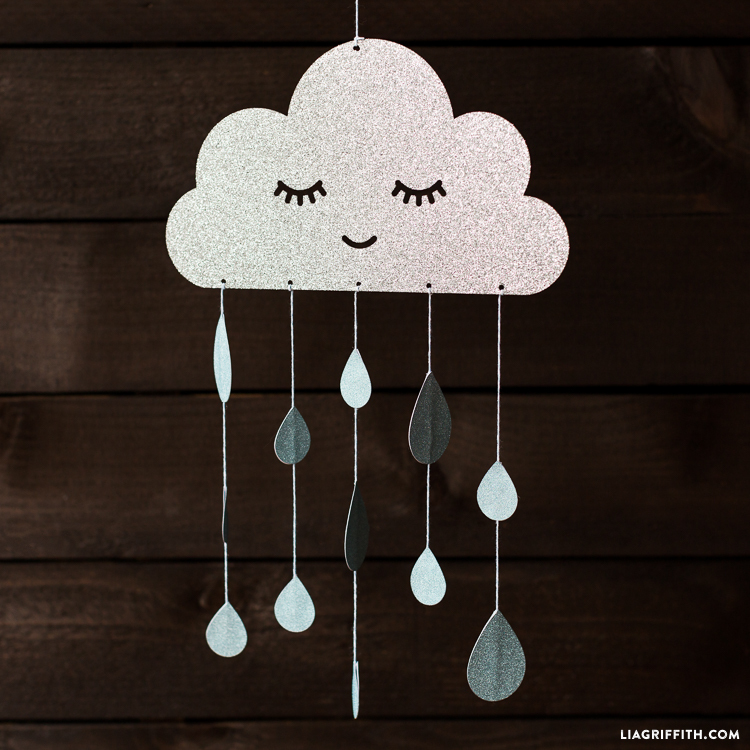 For the rain cloud, we started with a beautiful textured silver glitter card stock that we found at Michaels. If you are hand cutting, I would suggest using a hole-punch for the small circles at the bottom of the cloud. For the facial details, an x-acto knife is your best bet. Not to worry if you do not want to fuss with an x-acto knife! You could always paint the eyes and little smile directly onto the cloud. Next are the raindrops. We found another glittery card stock in a soft blue at Michaels that was the perfect color for a boy’s room or a girl’s room! Cut your raindrops out, making sure you cut two pieces for each raindrop. We decided to go with a more simple design that does not include very many raindrops, but you have the creative freedom to use as many raindrops as you would like. After cutting out the raindrops, choose a matching baker’s twine to attach them. Using a low-temp hot glue gun, glue each side of the raindrop to the twine. Once you have completed your strings, you are ready to tie them to the cloud! Add another string of baker’s twine to the top and it is ready for hanging. We just found out my daughter is PG so this will be cute in his or hers nursery,,thank you!! Ohhhh! Congratulations! That is just fantastic.